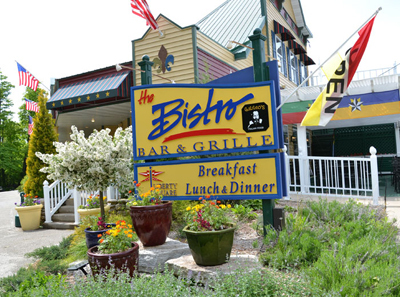 T he Bistro Bar and Grille at Liberty Square is a welcomed addition to the dining scene in Egg Harbor! What is “Liberty Square?” Liberty Square is an Egg Harbor center for dining, shopping, delis and more. The two buildings that comprise Liberty Square in the heart of Egg Harbor, warrant a definite stop on your next trip to Door County – for eating, and for shopping (9 shops under one roof), this is one elegant venue for food and fun! In speaking with the owners of Liberty Square (Rich and Pam), they describe their wonderful business like this: "Liberty Square Shops in Egg Harbor Door County is a charming village within a charming village. With 2 restaurants, a deli, and 8 interconnected shops along with family-friendly pricing, Liberty Square offers everything you need and whatever your heart desires. Enjoy quaint boutique retail shops. Discover two charming and popular restaurants. Stop at The Anchor Pub (whose predecessor dates back one hundred and fifty years in the same location) and more. Honored as ’Best Shopping Experience’ 2009 by Door County Magazine, our unique shops are filled with jewelry, children’s toys, books, games, art, women’s clothes & accessories, cards & stationery, natural cosmetics & fragrances, Door County products, wine & apparel." Serving breakfast, lunch & dinner, The Bistro is home to the “Fill Me Up” breakfast for about $8.99. Soups, salads, sandwiches, burgers, and pastries all served in a friendly indoor atmosphere, outdoors or carry-out. 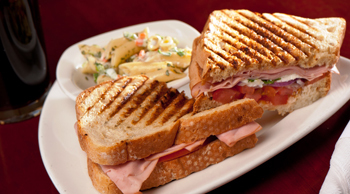 Enjoy a half sandwich with a perfectly matched soup or salad combo. Honored in the categories “Best Fish Fry,” “Best Place to Eat Healthy” & “Best New Restaurant” by Door County Magazine. In 2017, they have expanded the Bistro into the shop area and this is a terrtiifc. There is now overflow space into the shop area - also great for groups, wedding reharsals, family gatherings and more. They feature a healthy and tasty kids menu with family-friendly pricing. Gluten free & vegetarian items available and pet friendly. "Spend Less. Live Deliciously!" The Bistro itself is tastefully decorated, in rich colors, fine furnishings, upbeat art and inspirational quotes from some notables, such as “One cannot think well, love well, sleep well, if one has not dined well” (Virginia Woolf). We’re here to tell you that here you will get yourself started on the right foot, because here, you will dine well! The rest is up to you! For breakfast, lunch or dinner and throughout the year, you will find great food here. And now it is open until 10PM. We love this place, and have dined here often, and we are certain you will find the food creative, fun, and delicious. We have had the Classic Breakfast which comes with 2 eggs, hash browns and bacon or sausage and toast; and a terrific Mediterranean omelet - awesome. Try a gourmet pizza with BBQ chicken for dinner – comes with grilled chicken, their own homemade BBQ sauce, caramelized onions and a blend of five cheeses! This is a very good pizza – Italy would be proud! And in 2011, a new line of pizza was introduced. Chef Josh Blevins spent time this last winter in Washington DC at Ella's Restaurant - which won "best pizza" in the Capital! There is a lot on the menu, and something will appeal to just about anyone. Appetizers like pan seared crab cakes or baked brie en croute with fresh fruit and blueberry sauce; Lunch entrees like Turkey Bruschetta or Cuban paninis; great salads like a spinach pecan or a blackened salmon Caesar; to-die-for soups and chili – you must try the White Chicken Chili, and settle down for a wonderful dinner. And another thing I like is that anything on the lunch menu is also available for dinner. And the dinner menu has a wide selection of offerings, plus a couple of chef specials. Creative dishes like an entirely vegetarian beet steak fashioned to look and behave like a filet mignon. And The Bistro at Liberty Square also serves wine and has a very nice selection of wines at reasonable prices. And a nice feature of the menu is that it suggests wine pairings with your dinner selections! Nice touch. Visit their website for the full and up-to-date menu. In addition, you might want to check their website for additional dining options, like Galileo's Italian Food, also on the premises. You will also want to know that part of Liberty Square is 9+ retail shops all under one roof, too, and the NeeCee Lou's Deli too for on-the-go snacks, wine, gift baskets and more. 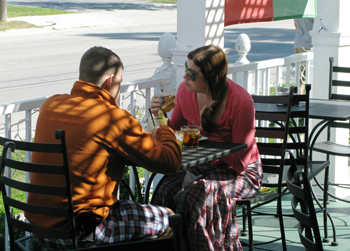 The Bistro Bar & Grille at Liberty Square has indoor and outdoor seating - so this is a great spot to dine! And the outdoor seating is dog-friendly! A great addition to the dining options in Egg Harbor and Door County in general, you will want to make The Bistro Bar & Grille at Liberty Square part of your next Door County trip plan! And please, if you see Pam there (one of the owners who is around and hands-on) or any of the other staff, please tell them that DoorCountyNavigator.com sent you! Enjoy – we know you will!